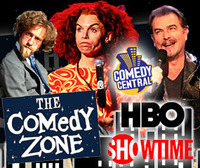 The Comedy Zone Fort Mill is a stand-up comedy club located beside Madisons On The Corner. Every week we offer a three-act comedy show with an emcee, feature act and a nationally known headliner. The Comedy Zone accommodates guests in a comfortable setting. Every seat provides an excellent view of the stage and for one low ticket price you’ll have a great time with some of the finest comedic talents in the business. In addition to sidesplitting laughs, you’ll also enjoy a selection of the areas best food from the MOTC's well renowned Executive Chef. And for those that wish to really make a night of it, there’s always the excellent bar to finish out your night at Madisons On The Corner. Be sure and check out our Dinner and Show Packages and find out how you can rent the room for your private event. For big laughs, award-winning food and great drinks, we’ve got it all. Call 803-802-3990 to make your reservation!! !